British technology satellite. 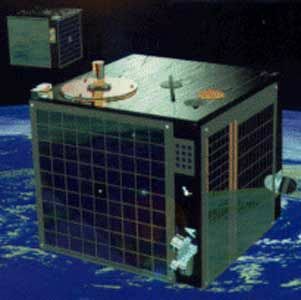 Technology satellite built by Defence Evaluation and Research Agency (DERA) for DERA, BMDO, ESA, UK. Launched 1994 - 2000. AKA: Space Technology Research Vehicle. Status: Operational 1994. First Launch: 1994-06-17. Last Launch: 2000-11-16. Number: 4 . Gross mass: 52 kg (114 lb). Height: 0.45 m (1.47 ft). The Space Technology and Research Vehicles STRV-1a and -1b were a pair of microsatellites designed to test new space technologies and make measurements of the space environment and its effect on spacecraft systems. The emphasis of the project was on low-cost, short timescale access to space and the rapid dissemination of experimental data. Although built and operated by the UK's Defense Research Agency, many experiments were collaborative, involving the Ballistic Missile Defense Organization, the European Space Agency and universities. After 2.5 years of operation the spacecraft were turned over to NASA and the University of Colorado for communications experiments. Each spacecraft had a 50 cm cubic structure based on carbon/PEEK thermoplastic skinned aluminum honeycomb panels. Four GaAs solar panels provided 31-33W (BoL) to a 28V power distribution bus and 16 NiCd batteries. Platform requirements were approximately 19W, leaving 13W for payload operations. On-board data handling used a GEC Plessey MIL-STD-1750 processor employing radiation tolerant SOS technology. ESA CCSDS telemetry and telecommand standards were observed. Communications were through the S-band (2.2GHz); 125bps uplink and 1kbps downlink through a 1W omni-direction antenna. Both STRVs were spin-stabilized at approximately 5rpm with attitude determination achieved via V-slit Sun and Earth sensors and analogue Sun sensors. Control was through magnetorquers and a cold gas thruster system. Both spacecraft carried a variety of space technology and environment experiments. Even the spacecraft's' carbon/PEEK structures were considered experimental. Specific payloads on -1a were the Atomic Oxygen Experiment, Battery Recharge, Cold Ion Detector, Cosmic Ray and Dosimetry Monitor, Langmuir Probe, Radiation Dose Rate Sensor, Surface Charge Detector and the Xenon Plasma Charge Neutralizer. On-board the -1b were the Cryocooler/Vibration Suppression Experiment, Infrared Detectors, Neural Network Microprocessors, Radiation Environment Monitor, Single Event Upset and Radiation Monitor and the Solar Cell Technology Experiment. Family: High earth orbit, Technology, Technology satellite. Country: UK. Launch Vehicles: Ariane, Ariane 44LP, Ariane 5, Ariane 5G. Launch Sites: Kourou, Kourou ELA2, Kourou ELA3. Agency: JPL, BMDO, UK Defence Research Agency. Bibliography: 2, 552, 554, 6, 6955. 1994 June 17 - . 07:07 GMT - . Launch Site: Kourou. Launch Complex: Kourou ELA2. LV Family: Ariane. Launch Vehicle: Ariane 44LP. STRV-1B - . Mass: 50 kg (110 lb). Nation: UK. Class: Technology. Type: Navigation technology satellite. Spacecraft: STRV. USAF Sat Cat: 23125 . COSPAR: 1994-034B. Apogee: 31,817 km (19,770 mi). Perigee: 278 km (172 mi). Inclination: 7.50 deg. Period: 557.00 min. 50 cm cube; Space Technology and Research Vehicle; included solar cell tests..
STRV-1A - . Mass: 53 kg (116 lb). Nation: UK. Class: Technology. Type: Navigation technology satellite. Spacecraft: STRV. USAF Sat Cat: 23126 . COSPAR: 1994-034C. Apogee: 31,321 km (19,461 mi). Perigee: 273 km (169 mi). Inclination: 7.40 deg. Period: 547.70 min. 50 cm cube; Space Technology and Research Vehicle; included solar cell tests..